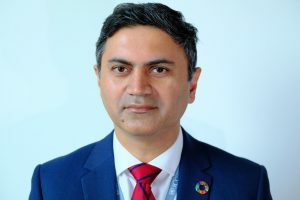 The UN Secretary-General has appointed Sameer Chauhan to the position of Director, ICC, beginning 22 August 2018. The ICC Director (interim), directly accountable to the ICC Management Committee that governs the organization, will assume his new post in Geneva, Switzerland. As per his Terms of Reference, Sameer has the responsibility to lead all aspects of ICC’s strategy and operations, to facilitate the provision of services to more than 50 Clients and Partner Organizations and establish an ICC strategy with business goals, a two- to four-business plan and a programme of work and budget, and implementing the approved plan. ICC faces a number of interesting challenges today in the areas of organizational growth and in service delivery evolution. The experience Sameer has gained of ICC and our Clients and Partners makes him an excellent choice to lead us through this interim period. Sameer joined the International Computing Centre 1 August 2015 as Chief, Clients and Projects. In this capacity, he was responsible for strategic product development including developing new products, establishing strategic private partnerships and developing new service offerings. He is also responsible for the CRM function tasked with managing, strengthening and growing the client base. He also spearheaded project delivery at ICC to manage and deliver all client and internal projects, including all consulting engagements. He was also the administrative head of the New York office of ICC. He brings over twenty years of prior professional experience in both the Public and Private Sectors and an educational background in Computer Engineering and Computer Science. Before joining ICC, Sameer was the Head of Knowledge Management and Digital Marketing IT for Deutsche Bank Asset and Wealth Management. Sameer played several roles at Deutsche Bank over eight years, including being the COO for an IT division of approx. 800 staff and externals worldwide. In that capacity, he handled annual budgets of over EUR 110m and provided oversight into all operational aspects including financials, audit, compliance, regulatory and operational risk, vendor management, and business continuity planning. He also established and managed processes to govern the entire change portfolio for Deutsche Application Services IT (6,000+ headcount). He started his career at Deutsche Bank as the Product Manager responsible for developing and delivering on the online platform strategy for a multi-billion dollar client platform for DB Prime Brokerage. Prior to Deutsche Bank, Sameer spent several years as a consultant for Deloitte, establishing a track record of delivering complex, global programs and projects for major global organizations across various industries, including Financial Services, Public Sector, Telecom, Manufacturing and Software. Please join us in congratulating Sameer, and committing to work together to continue the important organizational transformation work at ICC.